Please join us for the following events to learn more about the benefits of an Ursuline education! *Parents of sixth, seventh, and eighth graders are invited to hear a presentation from the Ursuline Administration and Faculty about the curriculum and programs of Ursuline. An extensive financial aid overview will be given as well as a tour of the Ursuline facilities. All 8th grade families in attendance will have the opportunity to enter to win a $500 tuition credit. Parents may RSVP for Prospective Parent Night at this link. *Only prospective students who attend a public school are required to take the exam. Parochial students will take the exam at their respective school. 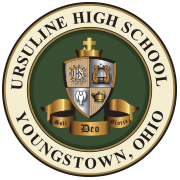 Parents may call Ursuline (330-744-4563) to register for the exam or follow this link.. There is no charge. Brazen Brush Art Party ~ T.B.A. *Meet the Ursuline Administration, Faculty, Coaches and Students at the annual Open House. Opportunities to learn about the complete Ursuline experience are available for the entire family Student led tours of the building will be available. Presentations from the Concert Band and the Speech and Debate Team will also be given. Financial Aid paperwork for the 2019-2020 school year will be available. All 8th grade families in attendance will have the opportunity to enter to win several tuition credit raffles. 3rd Grade Pen Pal ~ T.B.A. *Invitations will be mailed to all events to students who attend Saint Rose, Saint Christine, and Saint Joseph the Provider Elementary Schools. Invitations will also be mailed to families who have requested to be added to our mailing list. Ursuline encourages students from other parochial or public schools to please call Ursuline High School (330-744-4563) and request to be placed on the mailing list. Families may also call Ursuline to register for the events. Students from all schools, both parochial and public, are welcome to join us at the aforementioned events!